How to prevent the damage of air springs / How to extend the service life of air springs/struts? We are keenly aware, that the repair of your air suspension parts is neither inexpensive nor desirable. However, what can be done to increase the durability of your parts? Here are a few tips that will help you, perhaps not to avoid the repair altogether, but to at least postpone its due. 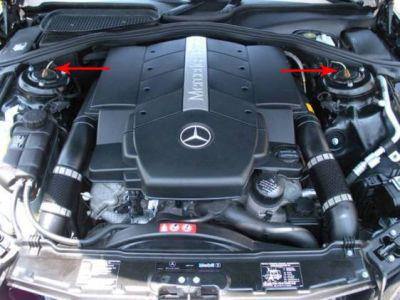 If your vehicle offers a separable air suspension (Audi Allroad A6 C5, Mercedes-Benz W164, BMW X5), you should regularly (about once a week) lift the car to the maximum position, and remove dirt with a high-pressure cleaner (keep the cleaner at a distance to the air spring about 30 cm/12 inches, otherwise water pressure can damage the air spring). The highest position may vary depending on your model and regulation options. Therefore, please test this by trying the different modes available to you (Sport, comfort, dynamic, off-road) and choose the one that sets your vehicle to the highest position. The dirt will most likely be found under the fold of the pneumatic chambers. If you find a frozen layer of bitumen on the piston guide (the part of a strut on which the air spring is installed), it is recommended to clean it as well. Whenever possible, avoid riding on fresh asphalt, as fresh bitumen mixed with sand immediately results in a build-up of abrasives on the piston and in turn contributes to accelerated wear and tear of the air spring. 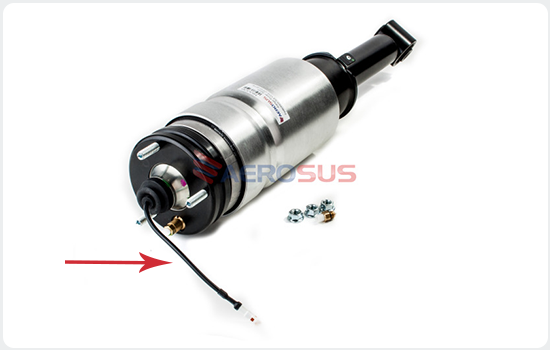 Many cars such as Mercedes W220 or W211 are set up with a complete air strut - shock absorber and air spring visually form a complete spare part. In many cases, you can easily recognize these by the metal cups with which the air spring is tightly mounted. To best avoid any damage, we highly recommend to regularly check the condition of the dust protection seals of the air strut. What does the manufacturer number (OEM) stand for and why do some products have more than one? Sometimes the car manufacturers assign more than one OEM number for a product. If you can find the OEM number you are looking for in the product information, then the product is compatible with your vehicle. What is the difference between an air spring and an air strut? The air spring is a part of the air strut. Some vehicles (e.g. 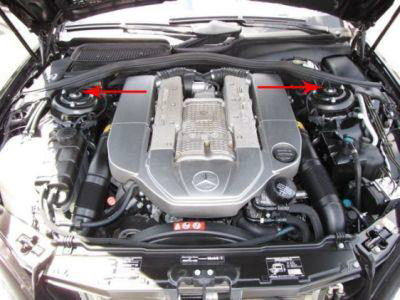 Mercedes ML) allow you to change the air spring separately. 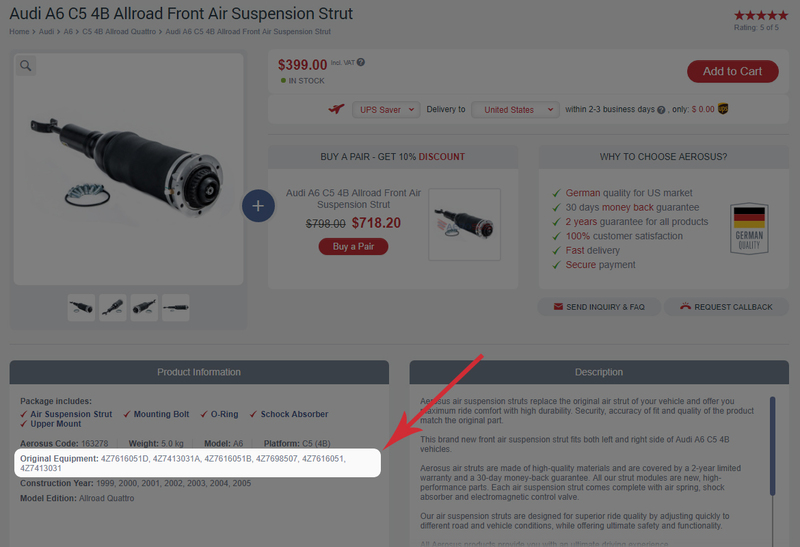 At our online shop you have the opportunity to buy either the whole air strut or only the air spring. For some type of vehicles it is not possible to change the air spring separately. In this case the whole air strut should be replaced. What is the warranty on Aerosus products? 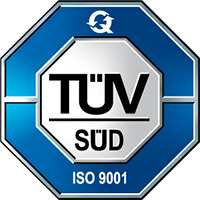 Our products are covered by a 2-year warranty. To return a product, fill in this return form and enclose it in your return package. If the part is defective we will either send you a new product or repair the part. Our Terms and Conditions apply. Some of our products are remanufactured, therefore a certain deposit fee is charged in order to maintain supply of the core parts. After you have installed the new part, please send the old part back to us and fill in this return form and enclose it to your return package. After receiving your old part we will refund the deposit amount to your account. Refund payments will only be made, using the same payment method you used to make the initial purchase. Please note that the deposit process can take some time. 4MATIC is the marketing name of a four-wheel drive system developed by Mercedes-Benz. It is designed to increase traction in slippery conditions. What does VDS mean and how can I tell if my vehicle is equipped with VDS? „VDS“ = Variable Damping Suspension. This system is specific to Range Rover products and similar in its functionality to alternatives like ADS (adaptive damping system) form Mercedes. Air suspension units that are equipped with this system feature a adjustable softness. 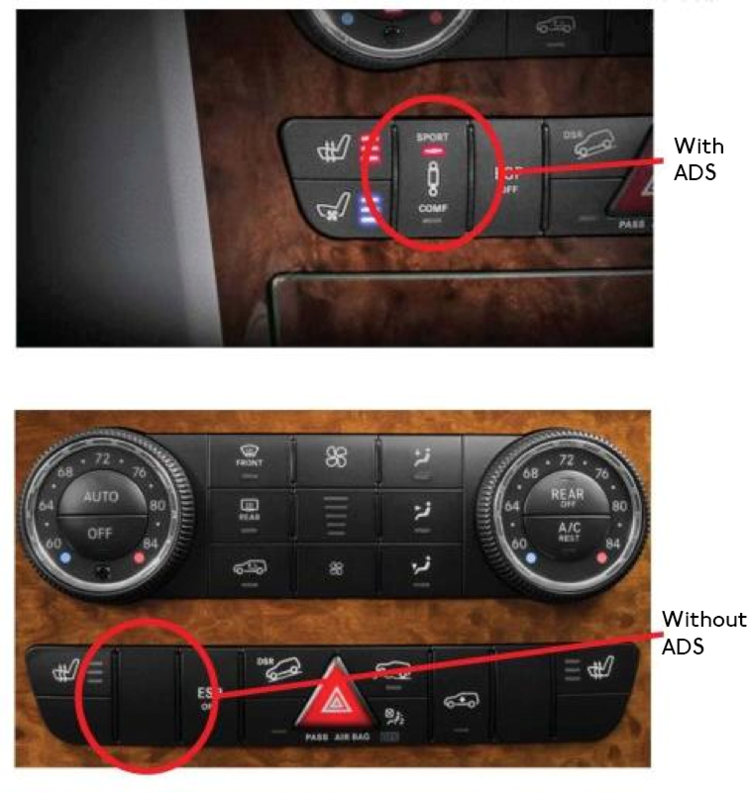 This function is used in vehicles with adjustable comfort or sport modes. Range Rover products with VDS come with an additional supply cord located at the top of the air strut. Air struts without VDS lack this cable. AIRMATIC is a Mercedes-Benz trademark for vehicles with air suspension systems. Compared with a conventional steel suspension, the AIRMATIC air suspension provides advantages in terms of handling safety and ride comfort. The AIRMATIC air suspension automatically adjusts the damping force on each wheel according to the current state of the road. ABC (Active Body Control) is a registered Mercedes-Benz trademark. It is a high-quality suspension system, which automatically adapts the suspension setting to the respective driving situation. There is also a crosswind stabilisation integrated in ABC systems. How can I see if my vehicle is equipped with AIRMATIC or ABC? You can check which suspension you have by opening the bonnet of your car and examining the top of the shock absorber. What does ADS mean and how can I tell if my vehicle is equipped with ADS? Yes. You'll receive an invoice in PDF format via E-Mail. Please check your SPAM filter for in few instances this mail is falsely filtered. How much does shipping costs and how long does it take to receive my order? We ship worldwide. To calculate the shipping time at the costs of your delivery you can use the shipping calculator. It can be found here. Which Payment methods does Aerosus accept? Information about payment methods accepted by Aerosus can be found here. Who has to bear the costs of the return shipment? Aerosus bears all shipping costs to USA. Contact us via our customer hotline or file your return online to get a prepaid return shipping label. Will there be any additional costs due to customs fees? All orders up to $800 are free from duties and taxes. 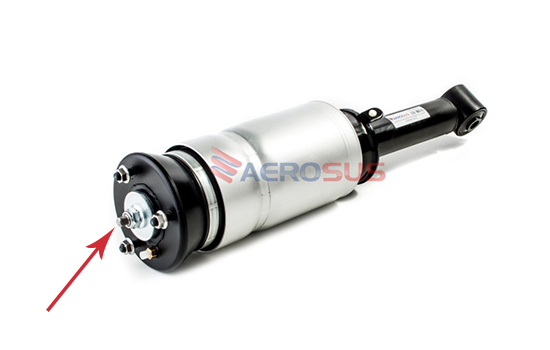 All Aerosus products are eligible for a full refund if returned within 30 days of purchase. You can carry out the return either via our customer hotline or directly via our shop’s online returns portal. 1. Please contact our customer service by phone or by email to let us know about the return. We will provide you with a prepaid return shipping label. 2. Fill in this form and enclose it in your return package. 3. Print the prepaid return shipping label and bring it with you at the post office to ship your parcel free of charge. 1. Please visit Returns and Refunds for a detailed information on how to request your return online. 2. After receiving your return request we will send to you a prepaid return shipping label and a Packing slip. Print both documents. 3. Enclose the Packing slip in your return package. Remember to bring the prepaid return shipping label with you at the post office. Refund payments will only be made, using the same payment method you used to make the initial purchase. Please note that you have to bear the costs of the return shipment. How can I return my old part and how do I get the deposit back? • "Reasons for the return" - "Return of the used part"
• "Preferred return option" – "Deposit refund"
Please ensure proper packaging of your item. Note that you have to bear the costs of the return shipment. Refund payments will only be made, using the same payment method you used to make the initial purchase. Please note that the deposit process can take some time. How secure is shopping on Aerosus? Nobody will have access to your encoded data. For your own security, always log out after shopping. Enter the code in the textbox. If it is valid, you will see a message. The value of the coupon will automatically be deduced from the total price. 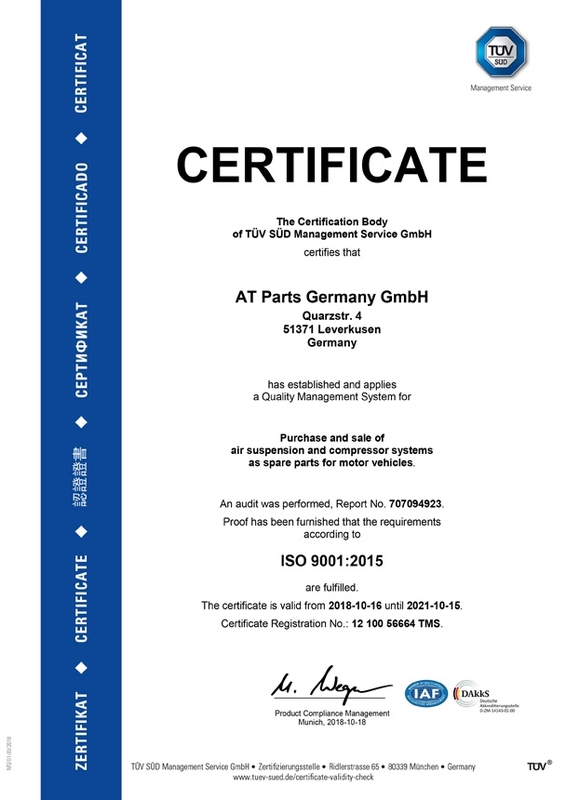 We are a European company with a valid VAT number (VAT identification number). How can we place an order in your online shop without VAT tax? 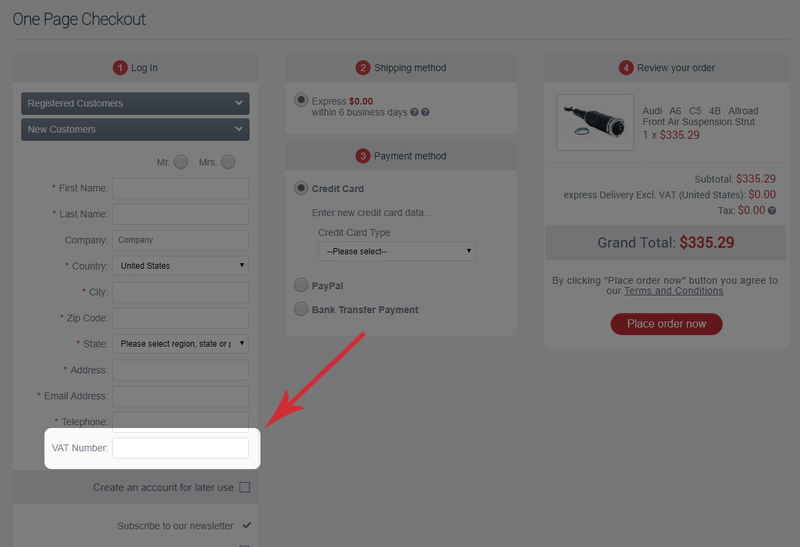 After placing all your requiried products into your shopping cart, click on the „Proceed to Checkout“ button. Now you will find the input field with the title „VAT number“ where you can enter your VAT ID number. Please be sure to enter your number without the country code, for example instead of HU13084040156 please enter 13084040156.